Apple's answer to the Amazon Echo is the $349 HomePod smart speaker. Apple’s New Gizmo Looks Like an Overpriced Echo. Here’s Why It Will Win Anyway. The $350 HomePod is billed as a combination of a smart speaker, like the Echo, and a wifi home speaker system, like Sonos. It might be a year or two late, but it isn’t a dollar short. Apple on Monday announced the HomePod, its long-anticipated answer to Amazon’s Echo and Google’s Home. The “breakthrough home speaker,” which appears to prioritize high-fidelity music playback over other functions, will set you back $350 when it ships in December. The Echo costs $180, the Home $110. The HomePod looks a lot like its rivals: It’s a chunky, mesh-covered cylinder that sits on a table and responds to voice commands. It wakes to “Hey, Siri” and will attempt to answer basic questions and control other devices in addition to playing tunes via Apple Music. On first glance, you might think Apple just copied the Echo, replaced Alexa with Siri, and jacked up the volume and price. Apple VP Phil Schiller shows off some of the questions HomePod will be able to answer. The features and price point seemed to puzzle some tech analysts: With the hefty price tag and the focus on sound quality, is Apple limiting itself to a niche audience of music-lovers? It’s a fair question, but one that overlooks Apple’s long history of outdueling rivals by introducing devices that offer higher quality and greater simplicity of use at an elevated price. The iPod, iPhone, iPad, and Apple Watch have all been more expensive and luxurious than similar devices from competing companies, yet they’ve all been bestsellers. Apple is betting that a lot of people—most of them probably not audiophiles—will be willing to pay a significant premium not only for the Apple brand (and the relatively seamless compatibility that comes with it) but for a device that can become their main home stereo system. Some techies might opt to hook up an Echo Dot to a Sonos, but Apple knows its customers would prefer an all-in-one solution. It also knows they love music (see: iPod). I’ve written before that Google might have a long-term edge in the smart speaker race, because it has the most advanced artificial intelligence technology. That means Google Home can answer questions that Alexa and Siri can’t. It’s a lot closer to the Star Trek computer. Realistically, however, the Star Trek computer remains a distant dream: A.I. is advancing rapidly, but anyone who’s ever had an exasperating miscommunication with a talking computer knows there’s a long road ahead. Apple’s recent emphasis on privacy and encryption could give it an edge here. 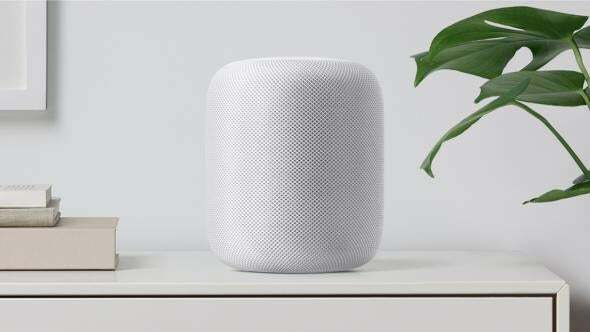 The company says the data your HomePod transmits will be encrypted and anonymized. That could help assuage customers’ fears, provided Apple succeeds in explaining to them what it means. Siri might not be the sharpest tool in the shed, but Apple knows hardware. It knows marketing. Increasingly, it knows privacy. And it knows that, for all its sci-fi promise, the smart speaker today is good mostly for one thing: playing audio on command. If the HomePod can do that substantially better than the Echo or Home, it might not matter that Apple gave Amazon and Google a head start and spotted them $200. Apple will win again.